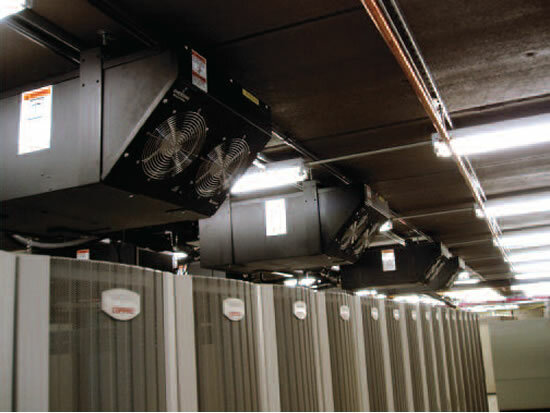 The Liebert XDO overhead cooling module mounts directly above the cold aisle, requiring no floorspace. This overhead cooling unit draws in hot air through two opposite inlets and discharges cool air down into the cold aisle where the electronic equipment air inlets are located. The Liebert XDO is a part of our high heat-density cooling product family that utilizes pumped refrigerant technology. The pumped refrigerant operates at low pressure in the system and becomes a gas at room conditions, making it ideal for use around electronic equipment. Since the Liebert XDO always provides 100% sensible capacity, the need for humidification is significantly reduced, further reducing energy usage and maintenance. The XDO system allows cooling-strapped data centers to add capacities without new construction. For Greenfield data centers, these systems can serve as dedicated cooling or can complement the baseline cooling and humidity control of traditional Liebert CRAC/H units. Is the Liebert XDO the best high density solution for your cooling needs? Our engineers can help you select the best high density solution for your cooling needs. Click here or Call 1-800-638-2638 for a free In-Row project evaluation. Can cool more than 500 W/sq.ft. (5400 W/m2). Smart Module or Standard configurations available. Complements Liebert precision cooling units. Excellent for spot and zone cooling. Flexible installation with several connection possibilities. Optional pre-charged flexible piping with threaded quickconnect fittings allows adaptive and scalable expansion without interruption of cooling operations. Possible to be fully installed from an existing cold aisle without the need for reaching over existing racks. Compatible with Liebert XDP, Liebert XDP with iCOM and Liebert XDC systems. Uses pumped refrigerant, which is ideal for use around electronic equipment. Complete packaged unit includes enclosure, coils, fan and piping. Superior cost for cooling per high heat density rack.